Like brown rice, black rice is rich in antioxidants and fiber. Most of the benefits are housed in the outer layer of ban that covers the grain. That bran makes black rice a grain that takes a while to cook, but its rich, nutty flavor is worth it. And it’s pretty gorgeous, too, especially with salmon. 1. Bring the rice, salt, and 2 cups (500 ml) of water to a boil in a medium saucepan over high heat. Reduce the heat to low and simmer, covered, for 40 to 45 minutes, until the water is completely absorbed. Fluff and set aside. 2. 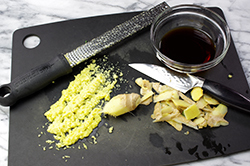 In a small bowl, whisk together the soy sauce, ginger, maple syrup, vinegar, and mirin. Set aside. 3. When the rice has about 15 minutes left to cook, prepare the bok choy. In a large sauté pan, heat the olive oil over medium-high heat and add the shallot. 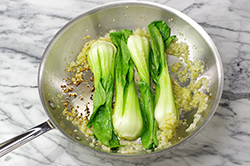 Cook for 1 minute, reduce the heat to medium, and add the bok choy. Cook for 2 minutes per side. 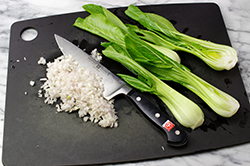 Transfer the bok choy and shallot to a plate and keep warm. Wipe the pan clean with paper towels. 4. 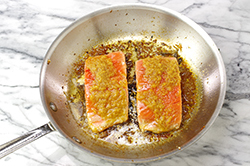 In the same sauté pan, heat the canola oil over medium-high heat and add the salmon. Pour half of the soy-ginger mixture into the pan and cook the salmon for 4 minutes per side. 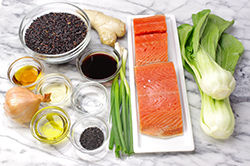 Transfer the cooked salmon to the plate with the reserved bok choy. Add the remaining soy-ginger mixture to the pan and warm over medium heat. 5. Onto each of 2 dinner plates, place 1 cup of rice. 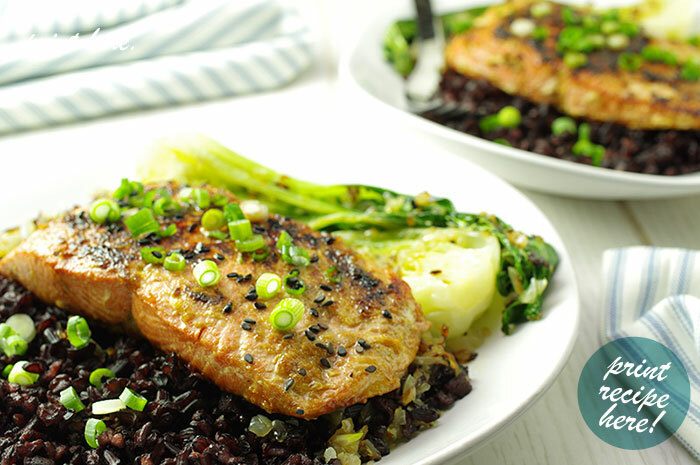 Top the rice with a salmon fillet and serve 2 bok choy halves along side Sprinkle each fillet with 1/2 teaspoon of the sesame seeds and 1 teaspoon of the scallions. Drizzle half of the warmed soy-ginger sauce over each plate, and serve hot.